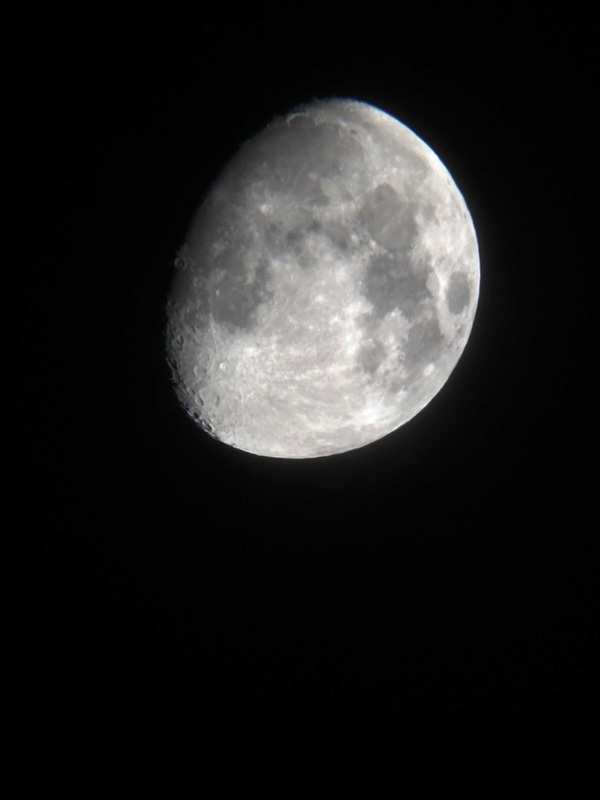 Last night's deep sky viewing plan was hampered somewhat by the 3/4 moon shining a bit too brightly in the background. 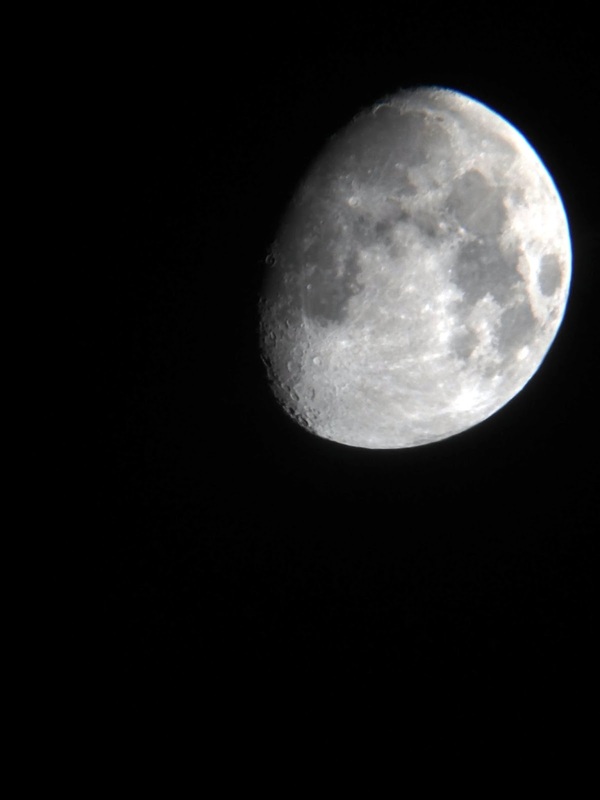 I wasn't going to miss the clear sky opportunity so turned the scope to take a look at the lunar spectacle instead. 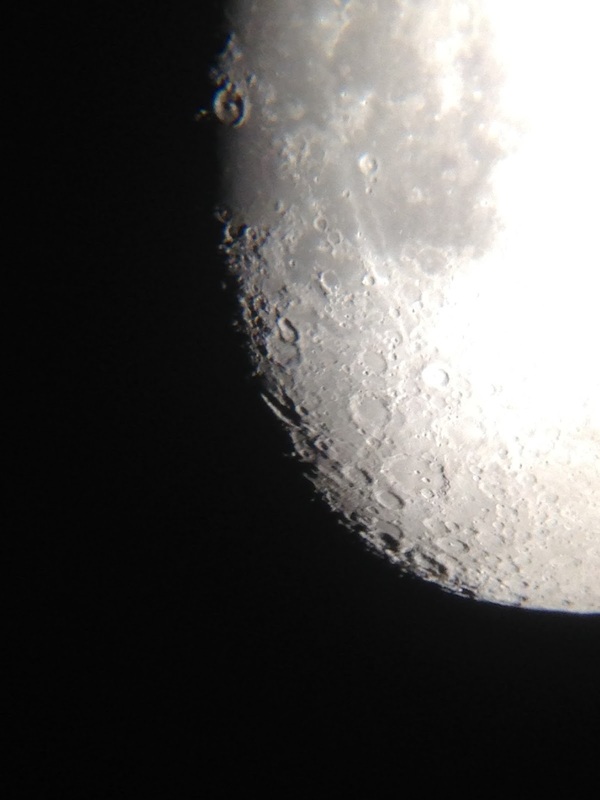 I'm not rehearsed in moon astronomy, but continue to be amazed by how its features look through the telescope each time. 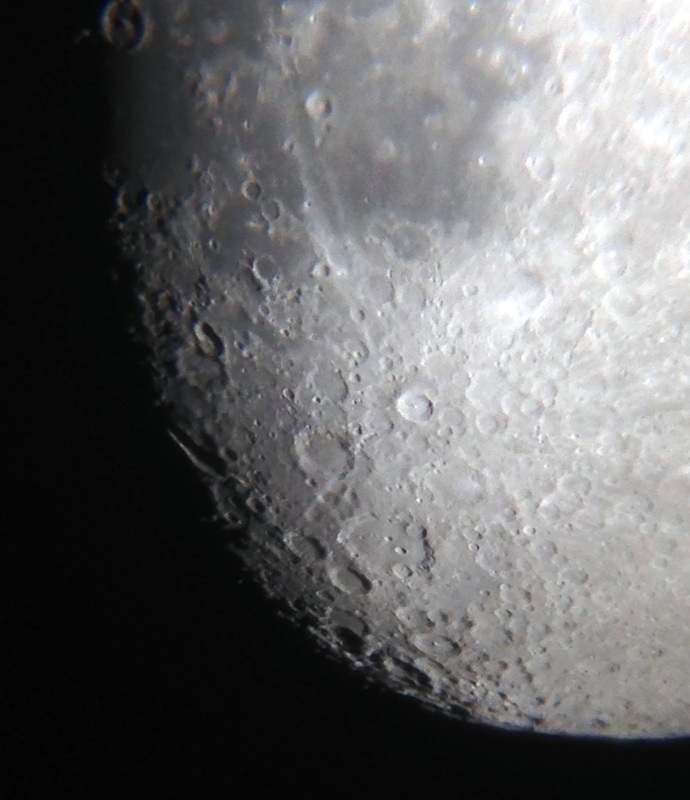 Not having any astro-photography knowledge, or equipment to write home about, I usually end up trying to catch a shot by merely holding up my iPhone 5s to the eyepiece. Trial and error, point and shoot - and wait till later to inspect the results! 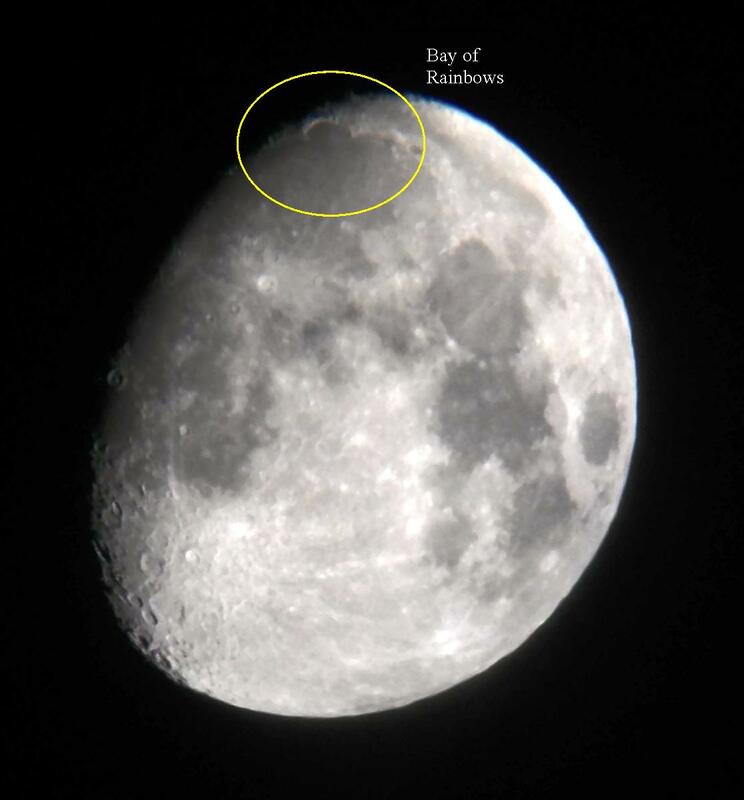 Later, reading tweets from astro friends, I noticed comments about the "Bay of Rainbows" showing up on the moon tonight. I did a quick search for images of the feature to see what it looked like and then compared back with my own photos. To my delight, I'd unwittingly captured a feint view of the Bay of rainbows in my photos too! A Nova (new star) was discovered on 14 August 2013 by a Japanese amateur astrologer. The Nova sits in the constellation of Delphinus, and stargazers familiar with the Summer Triangle should be able to locate between Deneb and Altair, just to the left of the pointer of Saggita. Its location in Delphinus is prompting astrologers to refer to it as Delphini Nova 2013. It is of a magnitude bright enough for it to be seen by the naked eye in extremely clear night skies, but easily viewable through a typical set of binoculars or through a small telescope. Grab your binoculars tonight and go take a look! Perseids Meteor Shower - August Sky Extravaganza! Monday, 12 August 2013 was a fabulous night in North Wales for stargazing and meteor watching. A stunning rainbow early evening predicted the pending clear skies, but I couldn't have anticipated the fabulous night scene that was about to unfold. 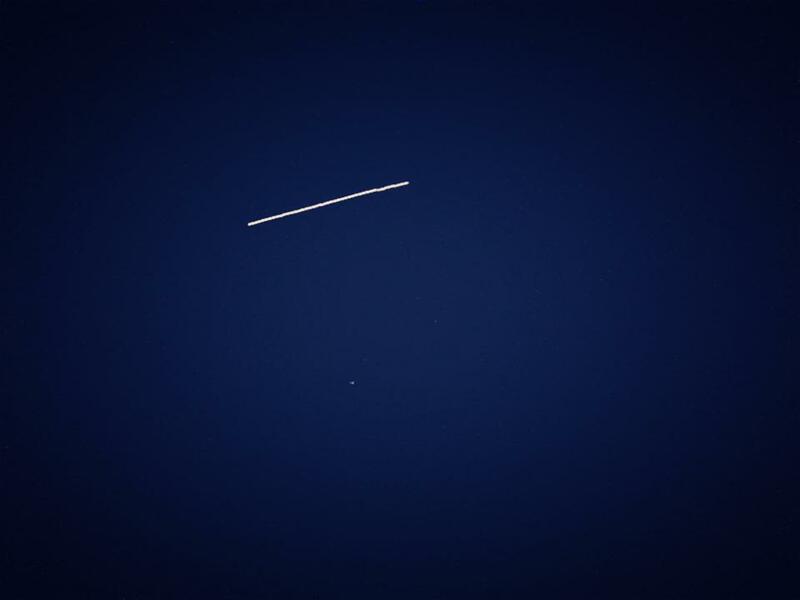 As darkness started to creep in, the clouds began to clear and just after returning indoors from seeing a fairly bright ISS pass around 9.30 pm the first taste of what was to come was spotted through the window in the form of a shooting star. On came the shoes, fleeces and hoodies and outside we went to look up at the heavens. After about 10 minutes, a glorious reddish, yellow ball shot across the sky from North to South. The Perseids radiant was located using my Google Skymap and as darkness engulfed us a few more streaks of light were spotted ... it was showtime! Sitting in our garden chairs, heads tilted back skywards we didn't have long to wait. Gazing generally up at the sky we watched the sky darken and the heavens light up with stars. The Milky Way was clearly in view, its hazy cloud of light displaying its millions of stars in all their splendour and as we gazed into deep sky we were intermittently delighted by a Perseid meteor chasing over us. The next ISS pass was due at 11:01 pm so we took up our positions ready to try to spot it. We didn't have to try very hard because at 11:02 the glorious sight of the International Spacestation came into view. Following a path from West to East it climbed high overhead, illuminated in brilliant light from the sun like a golden Eagle soaring against the backdrop of the beautiful sky we were seeing. We watched as it rose to its highest point and then slowly started to fade and turn a fiery orange red colour, mere seconds before it disappeared overhead from our view. 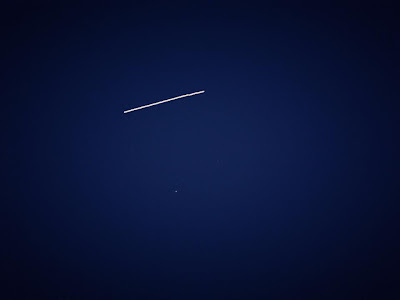 The best ISS pass I've seen this year, a fabulous grand finale to our stargazing extravaganza. 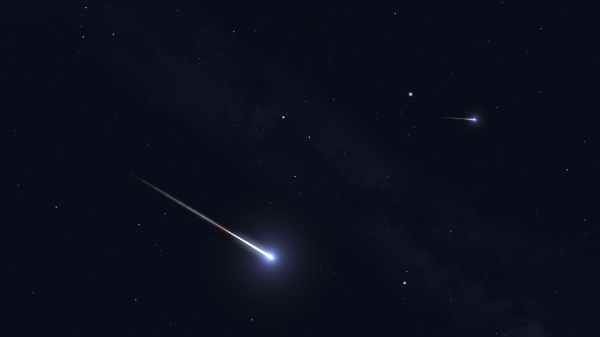 Read more about the Perseids and ISS passes on Meteorwatch or follow VirtualAstro on Twitter for regular updates and sky events as they happen! Its that time of year when Freshers are planning to fly the nest, move out of home and into University accommodation. Parents everywhere are helping them to plan what to take with them, and probably footing the bill for all of those essential items they need. With so much to think about at a time when emotions are already running high, these lists of what to take to uni will help students and parents alike to start putting together everything they need from cups and plates, to tin opener and corkscrew. Which planets are visible in the Northern skies this month? 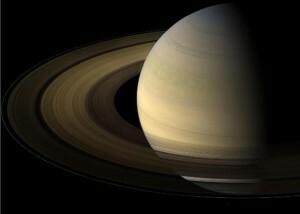 Saturn is still watching over us and is making some interesting aspects with various stars this month. Venus, the summer star is the brightest in the sky and can be viewed throughout the summer nights. Pluto is with us, although we are not able to view it with the naked eye, with a little skill and a good sky map we should be able to find it with a medium telescope. Jupiter is now only visible during the very early hours, as is Mercury but the Moon, as always dances her merry dance throughout the skies at various stages throughout July. Read more about the planets on view this month and check out the diagrams to help you find them in the nightsky in this informative article by EarthSky. 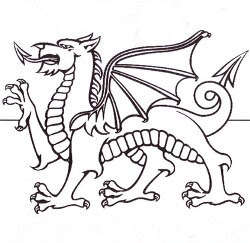 If you love all things Welsh you will love this selection of Wales colouring pages I've found on the web. If you have a printer, you can click on the links to enlarge the images, print off and then colour away to your hearts content. No need to buy your own Wales flag or rugby poster, just click, print and colour one instead!! The merging of Libra and Sagittarius can be paradise found for both Signs; this combination is a harmonious one, to say the least. Signs that are two positions apart in the Zodiac tend to have a very deep, special connection and understanding of one another. Sagittarius, the journeyer, is constantly in search of wisdom. 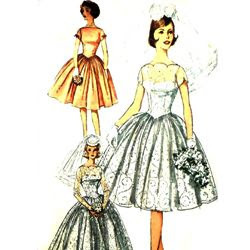 Libra has a mind keen for art, beauty and aesthetics; Libra makes a stimulating companion for Sagittarius on their travels and adds much to Sagittarius's experience. The relationship always feels new because these two keep it exciting -- and yet their natural understanding of one another makes them feel like intimates from the beginning. Together they will reach new horizons in love and in life. Libra and Sagittarius make great friends as well as lovers. They share a certain fresh-faced optimism in the world; they're both enthusiastic about finding truth and beauty in their experiences. Problems rarely occur. Occasionally Sagittarius may hurt sensitive Libra's feelings by speaking without thinking; conversely, Libra can sometimes be a bit too emotionally controlling for Sagittarius. Since Libra is a born diplomat who abhors conflict, they'll be able to smooth over any ruffled feathers. These two have the gift of forgiving and forgetting quickly. Libra is ruled by Venus (Love) and Sagittarius is ruled by Jupiter (Luck and Philosophy). Venus's femininity and Jupiter's masculinity make these Signs compatible and balanced. Sagittarius is constantly on a quest for knowledge of the big things -- the truth, the meaning of life and death -- and whenever Libra comes up with a new idea (as they are wont to do) Sagittarius is eager to go along with their partner and become familiar with this new concept. Libra is an Air Sign and Sagittarius is a Fire Sign. This partnership is full of kinetic energy. As air spreads fire and makes it grow exponentially, this relationship is heated and ardorous. Sagittarius thinks they're steering the rudder, but Libra controls the flow of events with a quieter hand. These two are energetic in the extreme and can run together far and wide. The relationship runs most smoothly when Sagittarius can feel they have plenty of freedom and independence within the relationship. Libra is a Cardinal Sign and Sagittarius is a Mutable Sign. Libra is an initiator; they think up new ideas and new places to go -- but can change their minds at a moment's notice. Sagittarius is flexible and adaptable, amenable to any changes Libra wants to make in plans. What's the best aspect of an Libra-Sagittarius relationship? 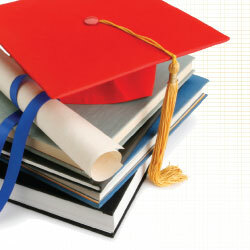 Their mutual interest in cultivating knowledge and utilizing intellect. They are well-matched and will go far together, both emotionally and geographically!